Pretty much done here! 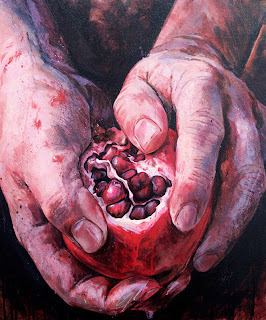 The painting is for a collection of poems by DH Lawrence, and the one we chose to illustrate was 'Pomegranate'. I was after a really hot, intense juicy and visceral image. 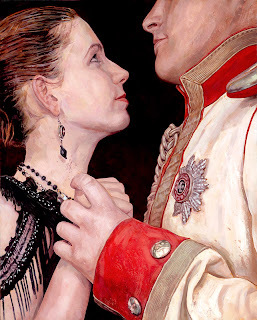 Also completed, and coming in on a very different tack is a new painting for a soon to be republished 'Anna Karenina'. 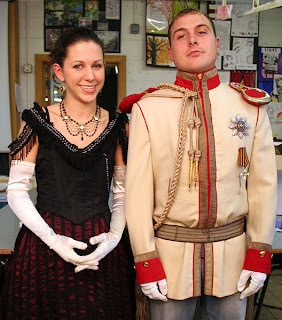 The scene illustrates Anna falling for Vronsky while dancing at a ball. It's a really warm, romantic image - and I think cropping Vronsky's eyes from frame lends it a little ambiguity - which I like. A big thanks on this one to the delightful Miss Sarah Lindsay and (equally pleasant) Fletch who very patiently baked under tungsten bulbs in 19th century duds while I faffed around with exposure settings. Also to Christine Isteed (my agent at Artist Partners) who was a superstar booking the job and costumes in for me. Cheers guys!